Hey there. I am a huge anime fan. Especially of Japanese Anime Films. While most are a but on the outrageous side, there are more than a few gems that are must watch films. Because they are animated, they may get overlooked, but trust me when I say that A Letter to Momo is one that you do not want to miss. And guess what? 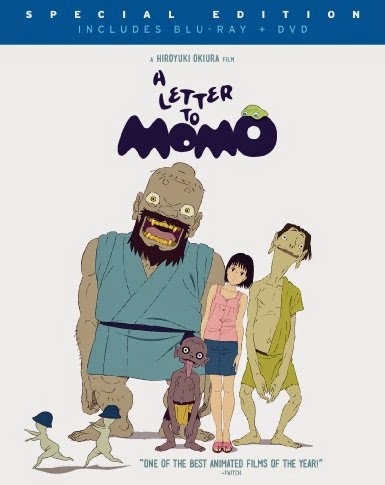 I've teamed up with Film Book and 4 lucky readers will win the A Letter to Momo Blu Ray Disc set! That's right, 4 winners!!! Before I get into the details, here is the synopsis of the film. The last time Momo saw her father, they had a fight, and all she has now is an unfinished letter by him that simply reads, "Dear Momo,". Momo and her mother move to the remote Japanese island of Shio and soon after, Momo discovers that trio of mischievous spirit creatures are living in the attic. Momo tries her best to keep them hidden and even though they are humorous, they also have a serious side. That serious side may just hold the key to helping Momo discover what her father had been trying to tell her. Giveaway runs from now until Nov. 11th. Entries are gained using the Rafflecopter widget below. Winners will be randomly selected. Giveaway is open to US residents only and winner must have a residential address. Sorry, no PO Boxes. The prizes will be mailed directly to the winner via USPS or FedEx. So, what is your favorite anime film? I am always on the lookout for new anime films to watch so I'm curious to know what you guys think is good! Good luck! sharing with us. I think it would be helpful for all.